When your age starts to show on your skin, choosing the right foundation can get a bit tricky. Applying the wrong product on your skin can easily highlight your fine lines and wrinkles. And with the wrong technique, you may even end up looking older than you really are. The good news is that finding the best drugstore foundation for mature skin isn’t that hard. In fact, with the products below, you should be able to achieve a flawless and natural looking finish without highlighting your problem areas. Revlon Age Defying Firming and Lifting Makeup is an interesting foundation, particularly for those dealing with aging skin. With its Tri-Shield Technology, this particular product can work as a moisturizer, serum, and primer. It’s supposed to lift your skin, hydrate it, and cover your problem areas. Another great thing about this product is that it’s actually formulated with broad spectrum SPF 15. While it’s not that high, its SPF rating should be enough to protect your skin from minimal sun exposure. Now, that doesn’t mean that you can skip your sunblock. Even if your foundation has SPF, don’t forget to apply your sunscreen before leaving your home. Apart from that, this foundation also has a wide range of shades. Whether you dark or light skin, you should be able to find the right shade that matches the natural color of your skin. The foundation goes on thinly on the skin so it won’t really accentuate your wrinkles and lines. Plus, since it’s not that heavy on the skin, you wouldn’t even feel like you’re wearing foundation. 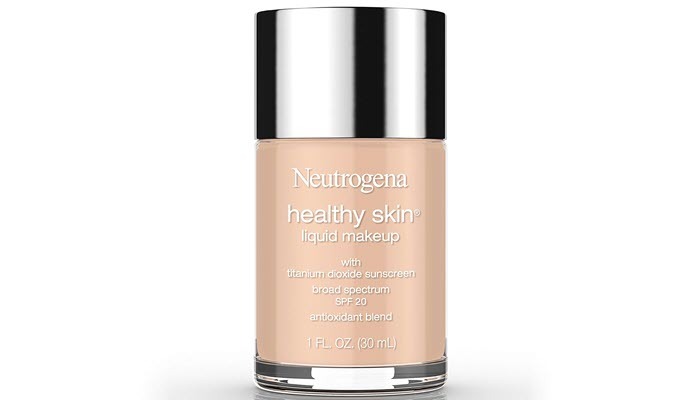 Neutrogena Healthy Skin Liquid Makeup Foundation is lightweight which is exactly what you need for mature skin. It glides smoothly on the skin while improving its luminosity, texture, and tone. Like our top pick, this particular product has broad spectrum SPF 20. It’s formulated with titanium dioxide so you should be careful when doing flash photography. The said ingredient is known to create a white cast on the face. This foundation is formulated with vitamin E, natural soy, and Feverfew. Those ingredients possess potent antioxidant properties which your skin needs to slow down the signs of skin aging. 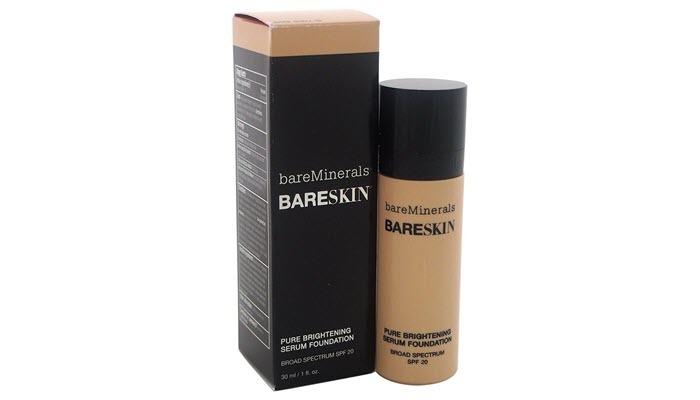 bareMinerals Pure Serum Foundation has a creamy consistency but that doesn’t mean that it’s heavy on the skin. In fact, this particular product actually feels light and comfortable. And with continued use, it can provide a lifting effect and anti-wrinkle benefits. 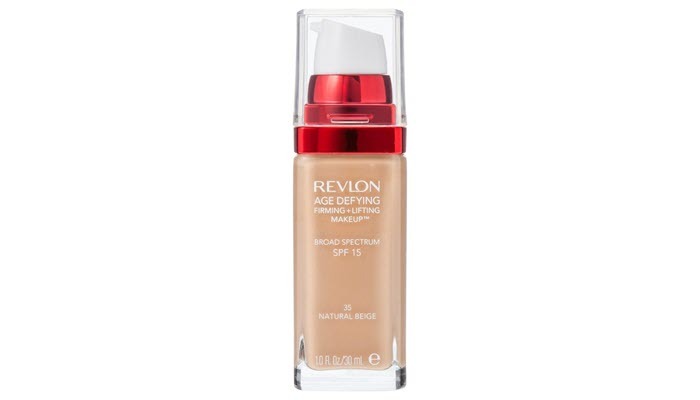 The foundation provides a decent coverage but it can’t fully cover really dark blemishes and spots. That’s not a totally bad thing, particularly if you want a natural look. 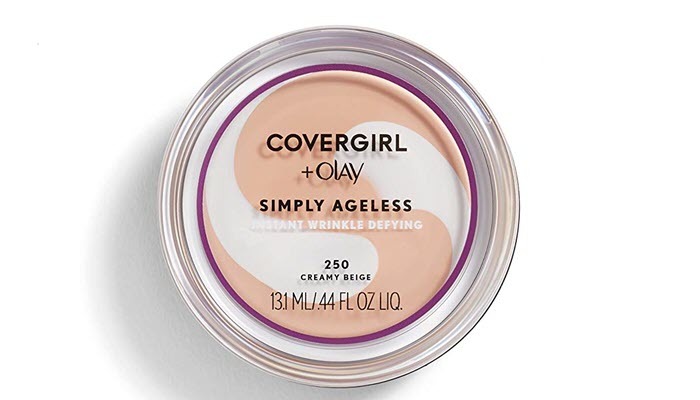 Covergirl & Olay Simply Ageless Instant Wrinkle Defying Foundation isn’t just a great choice for those on a tight budget but also for people looking for something that’s easy to work with. This particular foundation is easy to apply on the skin. It covers redness and evens out skin tone really well. 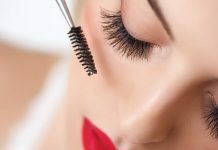 And since it’s long wearing, you won’t have to worry about frequent reapplication or touch-ups during the day. The foundation has a blurring effect to minimize the appearance of large pores and fine lines. It’s also formulated with SPF to protect your skin against further sun damage. The only issue you’ll find in this product is its packaging. 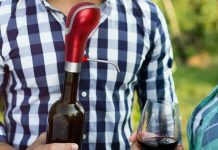 Since it comes in a pot, you’ll need to scoop the product out either with your fingers or a spatula. This makes the product prone to bacterial build-up. As for coverage, this one offers medium to full coverage. 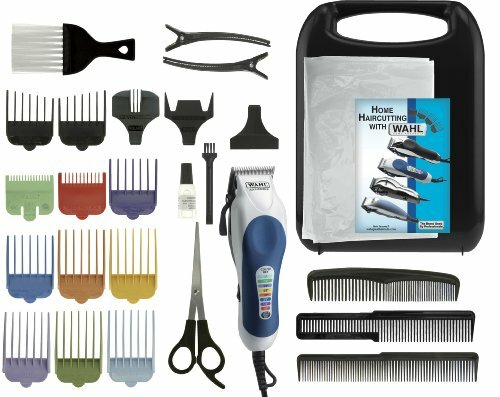 It’s buildable so you have more control over the product. It has this natural matte finish that makes mature skin looks really good. Mature skin has a different set of concerns. That’s one good reason to be extra picky with your foundation. Below are the criteria we used in finding the best drugstore foundation for mature skin. For your skin type, you should look for something that creates a natural-looking finish. With that, your best options include liquid or cream foundations. If you are also dealing with dry skin, you should consider an oil-based foundation that can lock in moisture. As much as possible, avoid really thick foundations as they tend to settle into your creases, making your lines more visible. There are a couple of ways to apply foundation. 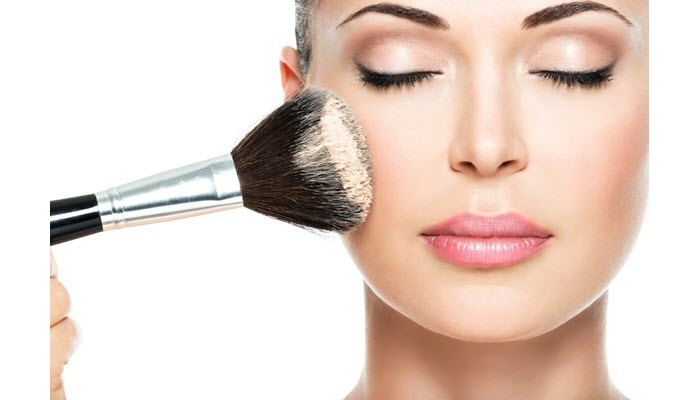 You can use a brush, a sponge or your fingertips to even out the product on your skin. A good foundation for mature skin should be easy to apply no matter which tool you use. This will depend on how much you want to cover. For mild blemishes and spots, a sheer to medium coverage foundation should be enough. However, if you are dealing with really dark sun spots and acne marks, try to find a full coverage foundation. Using the right shade of concealer prior to your foundation can help, too. 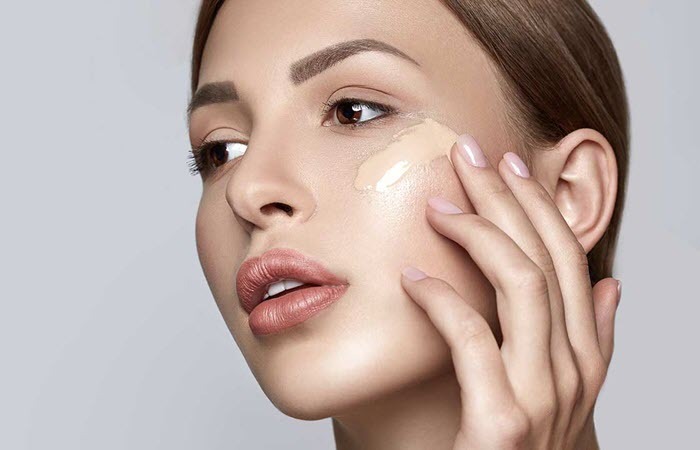 Applying a concealer reduces the foundation you need to put on your skin. The less foundation you apply, the fewer chances that you’ll get cakey results. Finding the right foundation can make you look younger or older than you’re supposed to. Since the right type matters a lot, particularly for your skin type, we are highly recommending Revlon Age Defying Firming and Lifting Makeup as the best drugstore foundation for mature skin. It offers just the right coverage you need to achieve that youthful glow. It also doubles as a moisturizer, primer, and serum. Plus, it has SPF, too. Apart from finding the right foundation, don’t forget to pick the right shade for your skin. Also, find out the best ways to avoid cakey foundation. And if you are dealing with oily skin, don’t forget to set your foundation with a good setting powder. If you don’t know how to do that, we’ll show you how.